Rhode Island might be the nation’s smallest state, but what it lacks in size it makes up in density, even though its legal real money poker laws don’t reflect the mix of people that make up its population. Featuring the second highest population density behind New Jersey, Rhode Island boasts a total population of nearly 1.1 million – higher than nearby Vermont and Delaware. That could certainly be a great Internet poker gambling community! Although there is no law that prohibits online poker and real cash Internet poker games like Texas Hold’em poker from being played in Rhode Island, the Ocean State’s gambling laws are a bit stricter than most states’ real money betting laws. Speculative talks regarding an interstate Internet poker compact between Delaware and Rhode Island have already begun, leading some to believe that lawful poker websites will make their presence felt in Rhode Island sooner as opposed to later. As more of its neighbors legalize state regulated online poker websites, these Internet poker gambling talks may begin to gain momentum, possibly resulting in Rhode Island’s first piece of online poker website legislation and that’s great news for RI legit poker betting fans. Punters in The Ocean State have a wealth of real money US poker sites to choose from. What are you waiting for? 2 Can Players from Rhode Island Play Online Poker? 3 Is Online Poker Legal in Rhode Island? In mid-2013, the state of Rhode Island took a decisive step towards establishing its real cash poker gambling presence by installing 66 new table games, including Texas Hold’em poker, at the Twin River Casino in Lincoln . 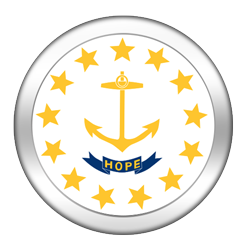 While certain tribal factions voiced their displeasure over the expansion of real money poker, the decision was met with overwhelming support by the majority of Rhode Island’s residents who love gambling in real cash poker games. The decision to expand the casino from a slot parlor into a full-fledged casino with live legal real money poker was made by RI voters in November, 2012. The Rhode Island Casino Gambling Amendment asked voters if they would be interested in a converting the Twin River Casino into a commercial casino and real cash poker venue, to which nearly 71% of voters replied Yes . Twin River hired 400 employees to man the new lawful poker tables, and revenues in the town of Lincoln went up 2 percent the month after the revamped casino opened its doors. The only drawback to Twin Rivers is that there is no specific poker room. However, there are rumors in the 2+2 Internet poker forums that the casino will add a proper real cash poker gambling room by early-2014. If so, Twin Rivers would follow the trend of most Pennsylvanian casinos by opening a real money poker room several months after they started spreading games like Blackjack, Roulette and Craps. Twin Rivers’ opening bodes well for the future of online poker for real money Internet poker gambling fans in Rhode Island, if only because it proves that residents of the state of RI are interested in legal gambling. It also would provide an online gambling and Internet poker provider with a physical location to set up shop. Can Players from Rhode Island Play Online Poker? Yes. Dozens of US-facing poker websites cater to the residents of Rhode Island. To find the real cash Internet poker website that’s right for you check our list of real money poker websites in Rhode Island, create an account, log on and scour the lobby for a cash game, SNG or real money Internet poker tournament. The legality of real cash online poker website betting in Rhode Island has not been addressed in any shape or form. To date, no legislation has been brought before government relating to Internet poker, and as far as we know, no bills have been drafted. The closest thing RI citizens have received to an actual Internet poker gambling bill is Delaware’s perceived interest in forging an interstate Internet poker compact with both Rhode Island and West Virginia. Since first expressing interest in 2012, Delaware has passed legislation legalizing Internet gambling and legal Internet poker games like Texas Hold’em poker. What this means for the prospects of an online poker bill in Rhode Island is currently unknown, although it does provide at least a glimmer of hope that lawful poker websites will one day exist for gambling enthusiasts in RI to do their betting at. The gambling and poker betting laws that do exist are vague and open to interpretation. While there are clearly no laws that prohibit playing online poker for real cash at Internet poker websites specifically, the penalty for participating in illicit gambling activities within Rhode Island’s borders seem particularly harsh. We are not an authority on the subject of gambling and legit poker betting regulations, but through our research, have managed to piece together several interesting shards of information about Internet poker that should at least allow you to make an informed decision regarding the legality of online poker websites. But generally speaking, it’s always best to consult a legal professional concerning these sensitive matters of real cash Internet gambling. Gambling laws in Rhode Island are among the least fleshed out statures we’ve seen. Shockingly, they fail to define what gambling and betting is. General assumptions about how RI lawmakers intended to define gambling can be made by glossing over the Forms of gambling prohibited. (Section 11-19-1) It states: Every person who shall, directly or indirectly, set up, put forth, carry on, promote, or draw ‘publicly or privately’, any lottery, chance, game, or device of any nature or kind whatsoever. This section draws more attention to those who set up illegal gambling and poker betting rings, not those who participate in them. Those found guilty of running a gambling facility in RI can be charged with a felony, and receive up to two years in prison and a $2,000 fine. Apparently, trying to convince or luring someone to an illegal gambling facility to participate in poker betting also carries a heavy penalty. According to Section 11-19-20, Every person who shall, on any pretext whatsoever, invite, entice, persuade, or induce any other person to visit any house, room, or other place kept for the purpose of gambling, can receive a fine of $500 and/or a one year prison sentence. You read that correctly – up to one year in jail for telling your friends about your buddy’s raked home game of real money Texas Hold’em poker. Even frequent participants are not exempt from the law. Anyone who plays in an illegal gambling or poker betting house with any frequency (the definition of frequency is undefined) is subject to up to 30 days in a Rhode Island prison. With that said, Rhode Islanders are well-advised to not gamble at a physical real cash poker betting facility that isn’t regulated by the state of RI, under any circumstances. For a more detailed look at Rhode Island’s gambling and poker betting laws, check out the “References” section As one would expect from a state that only recently opened its first commercial casino, Rhode Island’s gambling and real cash poker history is not nearly as glamorous as say, Nevada’s. However, as one of the original thirteen colonies, Rhode Island itself has a long and storied history, and at least to some extent, gambling and betting on real money poker is a part of its identity. Lawful gambling and betting institutions were prevalent throughout Rhode Island from the days of the early European settlers through the early 1900s. During this time, governmental agencies tried to enforce laws to restrict gambling and legal poker in RI, but did little to enforce them. It was only around the dawn of organized crime in the Roaring Twenties that the police crackdown on gambling and real money poker betting began, raiding many established underground real cash poker operations in the process. The state’s lottery was established in 1974, and gradually expanded to include multi-state Powerball drawings. Pari-mutuel real money betting consisting of slots, dog races, horse racing and other gaming machines, but not real cash poker, was added in 1993, effectively legalizing racinos in RI. It is believed the opening of nearby mega-casino Foxwoods caused Rhode Island to soften its stance on gambling and legal real money poker. Throughout the 90s and early 2000s, voters vehemently opposed the idea of a commercial casino and real cash poker venue. In 2006 the notion of a tribal run lawful poker operation was rejected. But by then more and more RI voters were becoming comfortable with the idea of a commercial casino offering games like Texas Hold’em poker, and in 2012 voted to expand Twin River Casino, a casino and racetrack formerly known as Lincoln Greyhound Park, into a decked out, fully operational real money gambling casino. Rhode Island online poker players can choose from well over a dozen Internet poker rooms despite the fact that iGaming is not legal in the state. Besides brick and mortar locations licensed to sell lottery tickets, Rhode Island hosts a plethora of gambling options. Pari-mutuel betting is allowed, as are charitable raffles and bingo. The one thing you won’t find much of is real money lawful poker, although its introduction to RI at Twin Rivers seems inevitable. Tribal gambling and poker betting has yet to be regulated, much to the dismay of tribal factions. Believing they could generate far more jobs and revenue than Twin Rivers, the Narragansett Indian Tribe’s Chief has gone as far as to state that Rhode Island is violating the tribe’s civil rights by not allowing it to open a full casino with real money poker gambling facilities . Right now, Rhode Island has not passed state legislature legalizing online gambling or real cash Internet poker nor has it seriously entertained the idea of legal poker websites. If anything, legislators from Delaware seem more interested in seeing an online gambling and poker betting bill pass in Rhode Island than its own government. However, the popularity of real money gambling on the lottery and the expected presence of live real cash poker at Twin Rivers in Rhode Island could spark a fire in government, especially if casino style games start raking in serious real cash betting revenue. If neighboring states Massachusetts and Connecticut legalize online poker and open lawful Internet poker websites, the always competitive Little Rhody might feel compelled to follow suit with their own Internet poker offering. Possibilities abound. On June 17th, 2013, the Twin Rivers Casino began spreading table games. What most people don’t know is that the only bet players could place was $5 real cash. After one day, the casino shut down its table games. Two days later, they reopened, only this time without the five dollar betting limit. It’s becoming fairly obvious that Rhode Islanders are finally in favor of regulated casinos and legit real money poker rooms. We wouldn’t be surprised if this change of opinion was brought on by the severity of Rhode Island’s gambling and poker betting laws. Or perhaps it’s because the state’s demographics are gradually changing. Maybe it’s the fact that neighboring Massachusetts has also loosened its attitude towards gambling and real cash poker. Despite this, the odds of an online poker bill being drafted for legal real cash poker websites in Rhode Island and passed through RI government within the next one, maybe two, years are exceedingly low. Rhode Island will likely continue to tread carefully, only pulling the trigger on online gambling after real money poker websites become a bit more widespread.